In this first-page splash of Ms. 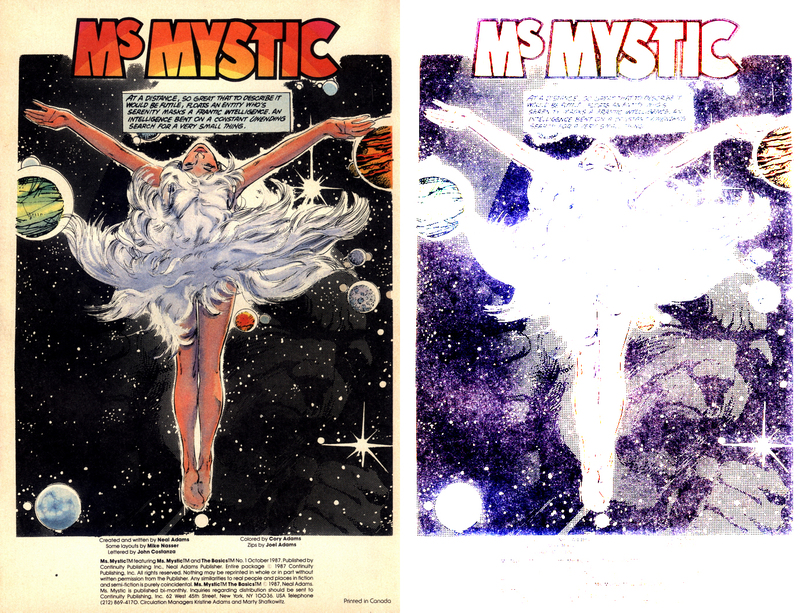 Mystic, penciled in the spring of 1977, I hid a sort of Easter Egg in the lower-right corner. Deadman. Though it’s barely visible on the printed page, anyone who has an issue of Ms. Mystic 1, by either Pacific or Continuity, can perform this test themselves. Simply scan the image and punch up the light intensity (levels – in Photoshop or other image editing software). Neal inked the Deadman head on that page, while the entire job was being inked for Pacific. He tried to obscure it even more than I did, so there wouldn’t be a claim of misappropriating Deadman by DC. It’s obscured so that’s it’s barely discernible. And even so, Neal could say it’s not conclusive. But in 1981, digital image editing was not as available to everyone as it is today. Back then, hiding Deadman this way was a safe bet. Not anymore. Anyone can see this same result, on their own copies of the actual comic book. Neal could say that he added this element to hint at a possible crossover with DC, as he did with Superman/Ali. The problem here is that this Deadman head is clearly penciled by me, and part of the overall design of a page that I composed and penciled very tightly. Most anyone who knows our work, can see that this Deadman head does not have the same feel that Neal’s own Deadman heads do. This adds another layer of hard-copy evidence refuting Neal’s lies about this project and about myself.